Sit back, relax, put your feet up – Woodland Creek’s has the best wood furniture couches and chairs around! When it comes to aspen furniture for the living room, come to Woodland Creek's Log Furniture Place. Our aspen living room furniture futons, chairs and couches are handcrafted and one-of-a-kind – for a unique rustic decor shopping experience. Get real country furniture at a great price: Browse our Aspen Mountain Log Futons, Aspen Ridge Log Chairs, Aspen Retreat Log Ottomans and more. 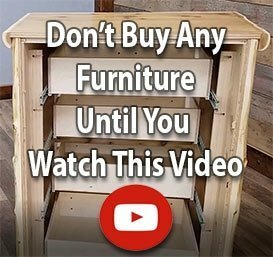 Are you tired of shopping for real rustic furniture in a sea of imposter only to come up empty? Isn’t it time you stopped shopping and started living? We bring you fine country decor reclaimed wood furniture sofas, sleeper sofas, futons and chairs made of naturally seasoned, dead standing timber rich in natural variations. See our Aspen Mountain Log Gliders and Rocking Chairs, Beartooth Aspen Upholstered Log Love Seats and Aspen Lodge Rustic Log Futons today!